From SBN contributor Chris Clemetson. It was a beautiful Saturday for a beer festival in Seattle, and it just so happened that the Great Pumpkin Beer Fest was taking place in Georgetown at Elysian’s new production brewing facility. Elysian claims this pumpkin-focused beer fest to be the granddaddy of ‘em all and it surely is impressive, especially if you are intrigued by pumpkin beers. This was my first time attending the event, but luckily I was accompanied by a self-proclaimed pumpkin beer aficionado. I enjoy trying new beers and styles that you can’t get anywhere else. The festival was truly impressive in the number and variety of pumpkin beers available. Even if pumpkin beer is not your favorite style there was enough variety and interesting beers to be had that I think anyone would have a great time. There were plenty of interesting beers available, but a couple in particualar stood out to me. The Silver City Punk Rauchen (Smoked Pumpkin Lager) was a campfire in a glass at first taste but the apple wood complimented the fresh pumpkin and the hops balanced it out well; overall it was a great Rauchbier. There were a few sour beers available to taste including the New Belgium/Elysian collaboration called KICK, which was a pleasure. There was a lot going on with this beer but I felt it was in great balance and I very much enjoyed it in the afternoon sun. Another notable sour was Mr. Yuck from Elysian. This had plenty of sour flavor, but it was gentle and smooth and was even enjoyed by my wife, who at best is skeptical when it comes to tasting sour beers. There were also some bourbon aged ales used as the base for pumpkin beers, including the Fremont Brewing Punk’n Bbomb. It was delicious with lots of bourbon up front and finishing with a nice compliment of spices. There were a few other observations that I noted. This was the first year that tickets were available for pre-order and as expected it was the way to go if you are the type of person that likes to plan ahead. The new Elysian production brewing facility is impressive; much bigger then I had anticipated. While most of the festival was held outdoors, a few stations were indoors so you could get a first-hand look at the facilities. I wasn’t at the Sunday session, but this year they made an effort to make sure that it wasn’t just the leftovers for Sunday and that no matter what day you went you would get an interesting selection of beers. Overall, we had a great time. It helped that the sun was shining, and this year turned out to be a great time. 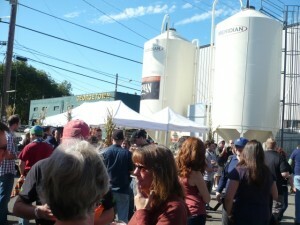 If you didn’t make it this year, I’d highly suggest looking forward to the GPBF in 2012. If you had any thoughts or favorites, let us know. My two favorites were Schooner Exact’s Gutter Punk’N and SouthernTier’s Pumking. I was able to pickup a bottle of Gutter Punk’N to take home from Full Throttle on the way home. Overall had a great time. Thanks to Elysian for putting on such a great event. Only complaint is their once again relying on just a few tables with many taps. Wish they would do something like SIBF where there are just two taps per table and tables could wrap around the venue. This would significantly decrees lines and perhaps even allow for more drink tickets sales since folks won’t be standing around so long. Otherwise, I had a great time at the fest. Just wish they would handle lines and crowd better. Oh..and perhaps an option to pay less and not get a souvenir glass? I have way too many now and they are just becoming garbage anyway. Nice recap, it really was a great event and my first time attending. There were so many outstanding beers here it was hard to pick favorites, but I want to mention a few I especially liked that didn’t make your list of standouts. – Allagash Ghouleschip – Citrus, pumpkin and lots of funk, I could drink this over and over again. – Black Raven Sasquashkin Imperial Stout – Great roast and toffee undertones from the caramelized pumpkin/squash. Elysian did this, such a forgotten style. Also really liked the Russian River sour pumpkin, but I would being a sour-head. This was a well organized festival with so many good beers, good food, and great laid-back atmosphere, it would have been hard not to enjoy. My favorite, I would have to say, would definitally be the Southern Tier Pumpking..went through that line about 6 times. The only thing I didn’t like about going was the waiting line…was in line for 1 1/2 hrs…but it was worth the wait. I got focked up mang.